Dhaka, Sep 1 (Just News): BNP on Saturday took a fresh vow to continue its movement for 'ousting' the current government to 'restore' democracy and people's rights. "We're taking a pledge on this day of our founding anniversary to continue our struggle to remove the monstrous government, and free our leader Begum Khaleda Zia for the restoration of democracy," said BNP secretary general Mirza Fakhrul Islam Alamgir. The BNP leader also hoped that their party's efforts to end 'misrule' will turn out to be successful very soon. 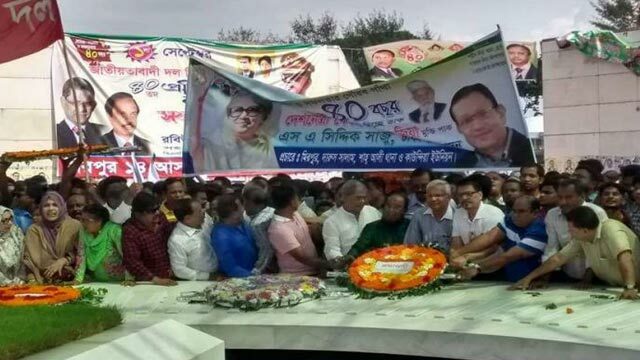 Fakhrul came up with the remarks while talking to reporters after placing wreaths at BNP founder Ziaur Rahman's grave along with party's leaders and activists, marking its 40th founding anniversary. He alleged that the government has snatched people's basic rights and destroyed all the democratic institutions. "It's now the main challenge for BNP to restore democracy and people's rights." Several hundred BNP leaders and activists together with Fakhrul, party standing committee members Khandaker Mosharraf Hossain, Moudud Ahmed, Dr Abdul Moyeen Khan and Amir Khosru Mahmud Chowdhury gathered at Zia's grave at Sher-e-Bangla Nagar around 10am and paid homage to their party founder by placing wreaths. They also offered a munajat seeking eternal peace for Zia's departed soul. On September 1, 1978, Shaheed President Ziaur Rahman founded the party with a 19-point programme to build a self-reliant Bangladesh. Party senior leaders said they have a plan for a 'massive showdown' in the rally to invigorate its rank and file ahead of the next general election. Earlier in the morning, the party flag was hoisted atop BNP's Nayapaltan central office and all other offices across the country, marking the day. Besides, the party's associate bodies and its all units across the country are marking the day holding various programmes, including discussion meetings. The party is celebrating the founding anniversary this year sans its Chairperson Khaleda Zia as she has been in jail since February 8 after a lower court convicted her in a case. After the assassination of Zia on May 30, 1981 in Chattogram, his widow Begum Khaleda Zia took over the party leadership. In its 38 years' journey, BNP had been in power for four times and was in the opposition bench twice. But following the January-5, 2014 election boycott, the party is now out of parliament. BNP senior leaders think they are passing through the toughest time since the party's foundation as it is out of power for a decade, but they hope it will turnaround very soon braving all the odds and obstacles.